Cytoplasm. Cytoplasmic in a punctate manner. Expressed mainly in adipose tissue, small intestine, heart, colon and stomach and, at lower levels, in brain, kidney and liver. Small volumes of anti-CIDEC antibody vial(s) may occasionally become entrapped in the seal of the product vial during shipment and storage. If necessary, briefly centrifuge the vial on a tabletop centrifuge to dislodge any liquid in the container`s cap. Certain products may require to ship with dry ice and additional dry ice fee may apply. Function: Binds to lipid droplets and regulates their enlargement, thereby restricting lipolysis and favoring storage. At focal contact sites between lipid droplets, promotes directional net neutral lipid transfer from the smaller to larger lipid droplets. The transfer direction may be driven by the internal pressure difference between the contacting lipid droplet pair. Its role in neutral lipid transfer and lipid droplet enlargement is activated by the interaction with PLIN1. May act as a CEBPB coactivator in the white adipose tissue to control the expression of a subset of CEBPB downstream target genes, including SOCS1, SOCS3, TGFB1, TGFBR1, ID2 and XDH. When overexpressed in preadipocytes, induces apoptosis or increases cell susceptibility to apoptosis induced by serum deprivation or TGFB treatment. As mature adipocytes, that express high CIDEC levels, are quite resistant to apoptotic stimuli, the physiological significance of its role in apoptosis is unclear. May play a role in the modulation of the response to osmotic stress by preventing NFAT5 to translocate into the nucleus and activate its target genes expression. Subunit Structure: Homodimer (By similarity). Interacts with CEBPB. Interacts with NFAT5; this interaction is direct and retains NFAT5 in the cytoplasm (By similarity). Interacts with CIDEA. Interacts with PLIN1. Post-translational Modifications: Ubiquitinated and targeted to proteasomal degradation, resulting in a short half-life. Protein stability depends on triaclyglycerol synthesis, fatty acid availability and lipid droplet formation (By similarity). Similarity: The CIDE-N domain is involved in homodimerization which is crucial for its function in promoting lipid exchange and transfer. NCBI/Uniprot data below describe general gene information for CIDEC. It may not necessarily be applicable to this product. Binds to lipid droplets and regulates their enlargement, thereby restricting lipolysis and favoring storage. At focal contact sites between lipid droplets, promotes directional net neutral lipid transfer from the smaller to larger lipid droplets. The transfer direction may be driven by the internal pressure difference between the contacting lipid droplet pair. Its role in neutral lipid transfer and lipid droplet enlargement is activated by the interaction with PLIN1. 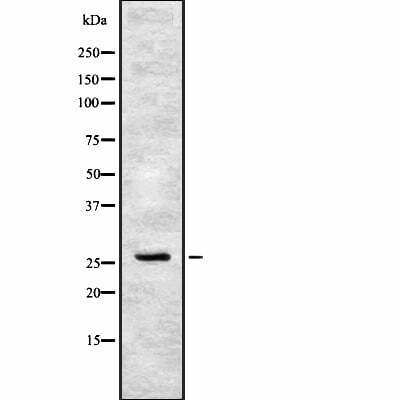 May act as a CEBPB coactivator in the white adipose tissue to control the expression of a subset of CEBPB downstream target genes, including SOCS1, SOCS3, TGFB1, TGFBR1, ID2 and XDH. When overexpressed in preadipocytes, induces apoptosis or increases cell susceptibility to apoptosis induced by serum deprivation or TGFB treatment. As mature adipocytes, that express high CIDEC levels, are quite resistant to apoptotic stimuli, the physiological significance of its role in apoptosis is unclear. May play a role in the modulation of the response to osmotic stress by preventing NFAT5 to translocate into the nucleus and activate its target genes expression. 1. FTO increased the lipid accumulation in hepatocytes by increasing nuclear translocation of SREBP1c and SREBP1c maturation, thus improving the transcriptional activity of lipid droplet-associated protein CIDEC.